I booked the leave 13 months ago. Yes, before I had even attended last year's festival. I love Bolton Food and Drink Festival. Love. It. This year's festival is over the August Bank Holiday weekend, which runs from 24th to 27th August. Four years ago the festival really changed beyond recognition from a small scale producers market to a weekend of events that now rival those hosted by our surrounding cities. In 2008 I was christened 'the crazy cake lady' by one stall holder. I might have bought eight of the same cake. So what...? Three years ago I vowed never to work the first day of the festival ever again, for fear of missing something! That was the year I got married and sacked off the diet in favour of Moroccan chicken and cous cous. This was also the year that one of the cheese vendors had such a pungent brew that you could follow the waft down to McDonald's. The year after that was inferno chilli year where my friend Matt was literally high off a sauce sample... Then last year we spent the Friday battling the rain but I came home happy with a bag full of assorted pies. The festival really does hold happy memories for me. Meeting up with friends, sampling silly sauces and smoked kippers (despite trying hard to like these, they are still gross) and watching the cookery demonstrations. It just gets better every year! A few months ago I heard a whisper from one of the organisers that Mary Berry and Paul Hollywood would be at this year's event. This is no exaggeration... I skipped down the corridor! I think I nagged her every day for a fortnight so I didn't miss the tickets going on sale! They will be joined by fellow celebrity chefs Jean Christophe Novelli, James Martin and Michael Caines. Emphasis this year is on eating well whilst using local produce. The line up includes some great local advocates, including The Mark Addy's Robert Owen Brown, Andrew Nutter and Bolton's own spice superstar Anjali Patak. There are a few tickets still available for some of the celebrity chef events, but you'll need to book fast in order to secure your spot! 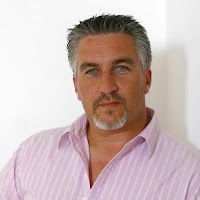 Friday 24th August - Paul Hollywood Gala Dinner, ring 01204 334400 to book. In addition to the ticketed events, there are a whole host of free events on around the town centre. They are absolutely free! Gratis! You can't get a kick up the bum for free these days. For more information, or to keep up to date visit www.boltonfoodanddrinkfestival.com, say hello on Facebook (tell them Dolly sent you...) and use the hashtag #boltonfoodfest on Twitter. Yay! Another great blog and (I am sure) another great Bolton Food Festival! Looking forward to the Gala dinner! We also have tickets for Mary Berry the day after. Oooh what time are you seeing the Mary show?